OCD is an affliction that is poorly understood. People joke “I’m a bit OCD”, when all they mean is that they are particular about tidiness. Few people are aware of the deep fear that drives this compulsive behaviour. Those who have this illness are convinced that real harm will come to the people they love if they do not carry out these protective rituals. They are immensely time-consuming. They try the patience of other people. They can seriously damage your social life, your job, your relationships. You may even feel unable to look after your baby, because you fear you may damage the child. The good news is that the condition is treatable. The earlier you start, the better the prospects. 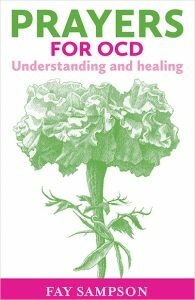 The left hand pages of the book contain information and advice about some aspect of OCD. On the facing page there is a relevant prayer. Part A is for those with OCD, or to be used on their behalf. Part B is for family, friends and the wider community. There is a list of resources at the end. Half the royalties go to OCD-UK. As children many of us skipped along the pavement, knowing that we mustn’t step on the cracks. We couldn’t have said what would happen if we did; we just enjoyed the shiver of excitement. That was a harmless superstition. But a minority find their lives destroyed by a compulsion to do or avoid doing something. This is OCD, Obsessive Compulsive Disorder. There is nothing enjoyable about it. Obsessions are thoughts that torment you. Typically, you fear you are going to harm someone you love. This leads to compulsive behaviour. You may hide every knife and pair of scissors. Or you’re fanatical about cleaning away germs. You may get up multiple times in the night to make sure you’ve locked the door or unplugged the iron. It is sometimes called ‘the doubting disease’. You have lost faith in yourself. Be reassured. These thoughts are so repugnant to you that there is not the slightest danger that you will act on them. You are the last person who would harm the ones you love. Your logical mind can know this, but it doesn’t take away that awful obsessive thought and the compulsive behaviour that goes with it. Only you know the fear that drives me. I know that what I do seems ridiculous to the people around me. They find it hard to keep patience with me. I know too that it’s ruining my life. A life you intended to be spent on better things. I can’t help myself. You see deep into my heart. You alone see the terrible thoughts that drive my compulsive behaviour. I have to find a way out of this. It seems like moving a mountain to get rid of the obsessive thoughts which dominate my life and compel my actions. Grant me a vision of a life free from my obsessions and compulsive behaviour. May I truly believe how wonderful that life would be. Take me by the hand and lead me to the place of healing. As if there weren’t enough stresses in teaching already. Now they’re wanting me to look out for cases of OCD. Do they know how many excuses there are for lateness, messy work, demands to go to the toilet? All right. I’ll calm down. I can hear your quiet voice telling me that each of my pupils is a precious child of God. Grant me the patience and understanding to find out more about this condition. May I be concerned enough to share this with my colleagues. Give me wisdom as I look at all these tangled young lives in my care. Help me to discern who might have OCD. May I examine their behaviour sympathetically. Guide me to understand what it must be like to have this bully in your head, demanding this unreasonable behaviour. Help me walk the fine line between making the right allowances and reinforcing their compulsive behaviour. In a crowded classroom, I am going to need wise judgement. Help me. Building on the success of Prayers for Dementia and Prayers for Depression, my publishers and I wanted to extend the series to help more of the many mental health conditions that inhibit people’s lives. I confess that I had little understanding of OCD myself before I began my research. I’ve been humbled to discover how lack of awareness can increase the pain of those who suffer from this condition. It is not a question of endlessly fussing to achieve perfection. Few of us know of the deep fear that drives this behaviour. Of the feeling of guilt that others will suffer if the rituals are not carried out. Even children have this bully in their heads, dictating what they do. I want to share the understanding I have gained. I have benefited from professional advice on whether to co-operate with the compulsive behaviour by sharing in checking on door locks, etc. I have learned to be aware of less obvious symptoms that may indicate someone suffers from this illness. I’ve found that the condition is very amenable to treatment.